OB-GYN group issues less restrictive VBAC standards in aim to cut number of repeated C-sections. The old saying, "Once a Cesarean, always a Cesarean," will hopefully start to fade soon, thanks to new medical guidelines from the American College of Obstetricians and Gynecologists (ACOG), The Associated Press reports. ACOG's new standards on vaginal births after Cesareans (VBAC) put an increased emphasis on a mom-to-be's decision and make it easier for women who have had previous C-sections to attempt to deliver vaginally with subsequent babies, The Associated Press reports. Under the revamped guidelines, women with past C-sections, women expecting twins and women with C-section scarring are now considered candidates for vaginal deliveries. Currently, 9 out of 10 moms-to-be who've had a previous C-section end up delivering their future babies via repeat C-section. Lamaze International says the new guidelines are a step in the right direction. However, the group also says it feels ACOG's language in the recommendations about the risk of uterine ruptures "may continue to unfairly limit women's access to VBAC," according to Lamaze's statement to USA Today. Officials are hoping that the new recommendations sway doctors who say medical liability concerns keep them from offering VBACs. Others also say the guidelines will help lower skyrocketing U.S. C-section rates. Federal statistics released earlier this year found that C-sections account for nearly one-third of all U.S. births, making surgical deliveries the most common operation in U.S. hospitals. 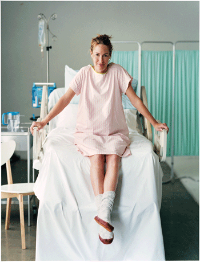 Having a Cesarean might seem like the easier and safer way to give birth, but it's not. Read our experts' explanation why it's riskier for you and your baby; plus, five ways to avoid having one. Fit Pregnancy understands that there are situations in which a surgical delivery is necessary. In case you deliver by C-section, here are four expert tips to help you prepare and recover. This year, our Ask the Labor Nurse blogger asked our readers how they felt about the current C-section rate. She received some insightful responses, which she shared online. Here's your chance to weigh in with your own thoughts on this women's issue.